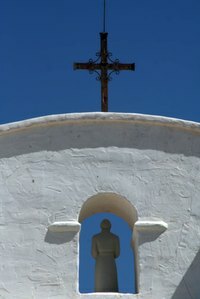 How do I Build a Model of a Santa Cruz Mission? If you are wondering how to build a model of the Santa Cruz Mission, chances are you have a fourth grader at home. California students in both public and private schools are often required to build a model mission in the fourth grade, and the task can be daunting. Using anything from papier-mache to sugar cubes, kids can build their mission model out of literally whatever material they see fit. And, the majority of the time, Mom or Dad is right there working alongside them to complete this challenging project. Browse photographs of the Santa Cruz mission online. Be sure to do an image search through an engine such as Google, and also visit the mission's official website through the California government homepage. Sketch on a piece of paper what you want your mission to look like. Work with any class instructions or guidelines received from your teacher. Make a list of any supplies you need and shop for these at your local craft and grocery stores. Draw placement lines on your base (plywood or cardboard). Be sure to include outlines for church walls, corridors, gardens, bell towers, etc. Any ground-level feature of your mission should be provided with these placement lines. Construct your walls out of your preferred material so they are at least three inches tall. You may use sugar cubes, clay, dry pasta, or anything else you can think of. Generally, there are no strict guidelines on material used, so feel free to be creative. Salt dough is often another popular choice, and the recipe can be found in the References section of this article. Make your roof out of dry pasta glued to cardboard, and then paint it your desired color, such as a brown-red that is often seen on actual California missions. You can also opt to leave your mission roofless and add detail inside, such as clergy figurines or furniture. If possible, visit the mission you've selected in person. This will give you inspiration for your project and add extra detail to it. Allow plenty of time to complete this elaborate homework assignment, as rushing through simply leads to cracked walls and unsteady foundations. Avoid the temptation to purchase a mission model kit unless it has been authorized by your teacher. Many schools do not accept these kits for the assignment completion. Going over three inches high with your walls can lead to unsteady construction. While many students do build higher than that, start small and work your way up to test the strength and durability of your model.